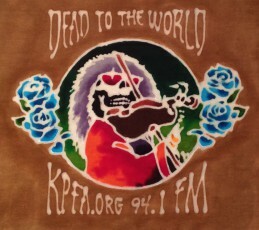 Dead to the World began on KPFA as The KPFA Grateful Dead Hour in 1990. When music programs were expanded to two hours in 1995, the name of the show was changed to Dead to the World and its mission expanded to include the wide world of musics that inspired the Dead — folk, jazz, blues, rock, country, noise, and more — and the musicians who were inspired by the Dead. Live performances from the KPFA Studio are featured as often as possible, and host Tim Lynch – like emeritus host David Gans before him — enjoys interviewing creative people as well as sharing their works. Tim Lynch began in radio in the early 1980s in upstate NY at WONY and WZOZ. Spending the second half of the 80s in Hawaii, Tim was a producer and manager at KTUH in Honolulu, participated in the “radio democracy” experiments of KDEO, and was a broadcast engineer at KITV television. After moving to the Bay Area in 1990, Tim was a pirate broadcaster at Berkeley Liberation Radio, and was associate publisher and senior editor at Pauserecord.com, as well as writing for An Honest Tune, Jambands.com, Jambase.com, and other print and online publications. He also produced the Saturday Ham Jam at KPIG-AM for three years. Tim began broadcasting at KPFA when he joined David Gans on the Dead To The World team in the spring of 2000, becoming the show’s primary host in 2015. Tim has been an avid fan of the Grateful Dead since before he first saw them in 1978, but also loves and broadcasts a wide variety of other music as well. Tim serves on the on the Unpaid Staff Council and the KPFA Local Station Board. Emeritus host David Gans got into radio by accident, after wandering into San Francisco’s KFOG in February 1985 to promote his book Playing in the Band: An Oral and Visual Portrait of the Grateful Dead. By the end of that year he was producing and hosting the weekly KFOG Deadhead Hour, which evolved into the nationally-syndicated Grateful Dead Hour. Gans did his first KPFA fund-raiser in 1986, and by the early ‘90s was hosting a 16-hour Grateful Dead broadcast during every Winter Fund Drive. David continues to produce the annual Grateful Dead Marathon and sits in occasionally on Dead To The World. He is also a writer and a working musician, with five books and more than half a dozen CDs to his credit. He served on the Unpaid Staff Council and the KPFA Local Station Board, and is a member of the Association of Independents in Radio and the American Federation of Musicians.